The Bahraini uprising of 2011 was a series of anti-government protests in Bahrain led by the Shia-dominant Bahraini Opposition from 2011 until 2014. The protests were inspired by the unrest of the 2011 Arab Spring and 2011–12 Iranian protests and escalated to daily clashes after the Bahraini government repressed the revolt with the support of Gulf Cooperation Council and Peninsula Shield Force. The Bahraini protests were a series of demonstrations, amounting to a sustained campaign of non-violent civil disobedience and later some violent resistance in the Persian Gulf country of Bahrain. As part of the revolutionary wave of protests in the Middle East and North Africa following the self-immolation of Mohamed Bouazizi in Tunisia, the Bahraini protests were initially aimed at achieving greater political freedom and equality for the majority Shia population, and expanded to a call to end the monarchy of Hamad bin Isa Al Khalifa following a deadly night raid on 17 February 2011 against protesters at the Pearl Roundabout in Manama, known locally as Bloody Thursday. 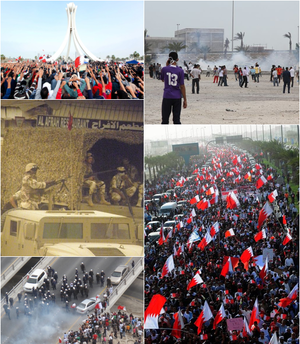 Clockwise from top-left: Protesters raising their hands towards the Pearl Roundabout on 19 February 2011; Teargas usage by security forces and clashes with protesters on 13 March; Over 100,000 Bahrainis taking part in the "March of loyalty to martyrs", on 22 February; clashes between security forces and protesters on 13 March; Bahraini armed forces blocking an entrance to a Bahraini village. Decisive Cabinet of Bahrain victory and suppression of the Bahraini opposition. Protesters in Manama camped for days at the Pearl Roundabout, which became the centre of the protests. After a month, the government of Bahrain requested troops and police aid from the Gulf Cooperation Council. On 14 March, 1,000 troops from Saudi Arabia and 500 troops from UAE entered Bahrain and crushed the uprising. A day later, King Hamad declared martial law and a three-month state of emergency. Pearl Roundabout was cleared of protesters and the iconic statue at its center was destroyed. In 1999, Hamad bin Isa Al Khalifa succeeded his father. He successfully ended the uprising in 2001 after introducing wide-ranging reforms, which 98.4 percent of Bahrainis voted in favour of in a nationwide referendum. The following year, opposition associations "felt betrayed" after the government issued a unilateral new constitution. Despite earlier promises, the appointed Consultative Council, the upper house, of the National Assembly of Bahrain was given more powers than the elected Council of Representatives, the lower house. The Emir became a king with wide executive authority. :15 Four opposition parties boycotted the 2002 parliamentary election, however in the 2006 election one of them, Al Wefaq won a plurality. The participation in elections increased the split between opposition associations. The Haq Movement was founded and utilized street protests to seek change instead of bringing change within the parliament. The period between 2007 and 2010 saw sporadic protests which were followed by large arrests. Since then, tensions have increased "dangerously". 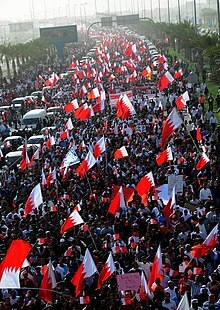 Subsequent days saw large demonstrations; on 21 February, a pro-government "Gathering of National Unity" drew tens of thousands,:86 whilst on 22 February the number of protesters at the Pearl Roundabout peaked at over 150,000 after more than 100,000 protesters marched there. :88 On 25 February, a national day of mourning was announced and large anti-government marches were staged. Participants were twice as much as those in the 22 February march, estimated at about 40% of Bahraini citizens. Three days later hundreds protested outside parliament demanding the resignation of all MPs. As protests intensified toward the end of the month, King Hamad was forced to offer concessions in the form of the release of political prisoners and the dismissal of three government ministers. Later in the day, surgeon Ali al-Ekri was arrested from the still surrounded Salmaniya hospital and by April another 47 health workers had been arrested. :43 Their case drew wide international attention. Patients at the hospital reported getting beaten and verbally abused by security forces and staff said patients with protest related injuries were kept in wards 62 and 63 where they were held as captives, denied health care and beaten on daily basis to secure confessions. :35–6, 42 Physicians for Human Rights accused the government of violating medical neutrality and Médecins Sans Frontières said injured protesters were denied medical care and that hospitals were used as baits to snare them. The government of Bahrain dismissed these reports as lacking any evidence and said forces were only deployed in the hospital to keep order. On 9 August, the Bahrain Independent Commission of Inquiry announced that 137 detainees had been released, including Matar Matar and Jawad Fayrouz, Shia MPs from the Al-Wefaq opposition party. Bahraini independents worried that the island will slide into sectarian violence also began an effort to break the political stalemate between pro-government and opposition forces. Dr. Ali Fakhro, a former minister and ambassador "respected across the political spectrum", told Reuters that he hoped to get moderates from both sides together at a time when extremists are making themselves felt throughout the Gulf Arab state. Fakhro said the initiative, launched at a meeting on 28 January 2012, involved persuading opposition parties and pro-government groups meeting outside a government forum and agreeing on a list of basic demands for democratic reform. He launched the plan at a meeting of prominent Bahrainis with no official political affiliations or memberships, called the National Bahraini Meeting. A basic framework for discussion is the seven points for democratic reform announced by Crown Prince Salman in March 2011. According to a report by a Bahraini human rights body, the country saw 745 protests in just December alone. The government's reaction to dissent included arrests of 31 children, home raids and enforced disappearances. Out of the 745 "sporadic protests", more than a half were suppressed by security forces, according to a report by the Liberties and Human Rights Department in Al Wefaq National Islamic Society. On 3 March, a bomb blast by Shia protesters in the village of Al Daih killed 3 police officers. One of the police officers killed was an Emirati policeman from the Peninsula Shield Force. The two other officers killed were Bahraini policemen. 25 suspects were arrested in connection to the bombing. In response to the violence, the Cabinet of Bahrain designated various protest groups as terrorist organizations. In November, the first parliamentary elections were held in Bahrain since the beginning of the protests despite boycotts held by the Shia-majority opposition. On 15 January 2017, the Cabinet of Bahrain passed a capital punishment sentence of execution by firing squad on three men found guilty for the bomb attack in 2014 that killed three security forces. Al Khalifa regime in Bahrain, knowingly refused for more than two years to investigate complaints regarding the torture of Mohamed Ramadan—a father-of-three on death row who was tortured into making a false confession. In February 2014, Mohammed was arrested from Bahrain International Airport, where he worked as a police officer. He was accused of involvement in an attack on other police officers, despite a total lack of evidence tying him to the crime. In reality, Mohammed is an innocent man who was arrested in retaliation for his attendance at peaceful pro-democracy demonstrations. Following his arrest, Mohammed was brutally tortured by police into signing a false confession, despite his innocence. During his initial detention, police officers told Mohammed outright that they knew he was innocent, but were punishing him as a traitor for attending pro-democracy demonstrations. During his entire detention, Mohammed has never been allowed to meet with his lawyer. The day Mohammed's trial began was the first time he ever saw his lawyer's face. In that trial, he was convicted and sentenced to death almost solely on the basis of confessions extracted through prolonged torture. Reprieve a human rights defender organisation published an investigative report about Britain involvement in Bahrain's regime atrocity in 2016. The report says that seven innocent men are facing the death penalty in Bahrain after being tortured into the false confessions of crimes. On 15 January 2017, Cabinet of Bahrain passed a capital punishment sentence of three Shia protesters convicted of orchestrating a bomb attack which killed 1 Emirati policeman from the Peninsula Shield Force and 2 Bahraini policemen on 3 March 2014. 42 year old Sami Mushaima, 21 year old Ali Al-Singace, and 27 year old Abbas Al-Samea confessed of orchestrating the bomb attack and were executed by firing squad. According to Americans for Democracy & Human Rights in Bahrain, Bahrain security forces arrested Sami Mushaima in March 2014 and held him incommunicado for at least 11 days. Security officials subjected Mushaima to beatings, electrocution, sexual assault, and severely damaged his front teeth. Mushaima's family believes he was coerced into falsely confessing through the use of torture. Sami Mushaima, Ali Al-Singace and Abbas Al-Samea executions have sparked protests from members of the opposition in Bahrain. In July 2014 Bahrain expelled the United States Assistant Secretary of State for Democracy, Human Rights and Labor, Tom Malinowski, after he had met members of the leading Shia opposition group, Al-Wefaq, a move that the Foreign ministry of Bahrain said 'intervened in the country's domestic affairs'. Previously, in May 2011, pro government websites and newspapers targeted US embassy's human rights officer, Ludovic Hood, and published information on where he and his family lived after accusing him of training and provoking demonstrations, being a Zionist and working in cooperation with Hezbollah. Hood had been photographed handing out donuts to demonstrators outside the US embassy in Bahrain. The US government subsequently withdrew Hood from Bahrain. Bahraini human rights groups and opposition parties have heavily criticized recruiting mercenaries in the Bahraini security forces. Nabeel Rajab said "They're told they are going to go to a holy war in Bahrain to kill some non-Muslims or kafir [infidel] or Shias ... And those are maybe responsible for a lot of killing and a lot of systematic torture and human rights violations committed in the past months and years". Michael Stephens, of the Royal United Services Institute linked recruiting mercenaries in the Bahraini security forces to the lack of government confidence in its own citizens. "So they rely on foreign recruits to unquestioningly carry out orders of violently suppressing protests", he said. Bruce Riedel, a leading American expert on South Asia said "when the very serious demonstrations began and it looked like the regime might even be toppled at a certain point, their hiring of mercenaries went up substantially". Media associated with the Gulf Cooperation Council, keep labeling the Shia-majority population in opposition to the ruling Sunni regime as "terrorists", "anarchists" and "trouble makers." At the same time, the Bahraini regime is presented as non-secterian, tolerant and merciful. On 29 September 2012, US journalist Amber Lyon, who was covering the uprising for CNN, described her investigation of how the US ally Bahrain was committing human rights abuses, but said that CNN and the US government pressured her to suppress the news. A documentary on which she had been working was never aired. Despite being banned in Egypt, Al Jazeera went to great lengths to provide non-stop live coverage of events. It did not do that in Bahrain. I do believe that Al Jazeera and other channels were not balanced in dealing with the events," he said. "For instance, with respect to the events in Syria and Bahrain, we started to invite guests from America who only criticize the regime in Syria and support the regime in Bahrain and persons who justify NATO intervention. This is unacceptable. In April 2011, David Pollack at the Washington Institute for Near East Policy, noted that, "Al jazeera Arabic did not report on the hardening of the Bahraini opposition on March 8, when the Coalition for a Bahraini Republic called for an end to the monarchy, nor did it cover protests held there on March 9, 10, and 13, the critical days leading to Saudi Arabia's decision to send troops into Bahrain." In one extreme example Pollack noted that at one point Al Jazeera English had a picture of Saudi troops headed across the causeway connecting Saudi Arabia and Bahrain while Al Jazeera Arabic ran a completely different headline proclaiming "Bahrain's Government Rejects Foreign Intervention" — alluding to a rejection Iranian interference. In 2010, a WikiLeaks document mentioned Al Jazeera several times. One such document revealed that the Qatari government referred to Al Jazeera as "a bargaining tool to repair relationships with other countries, particularly those soured by Al Jazeera's broadcasts, including the United States." This was confirmed by another WikiLeaks document stating "Relations [between Qatar and Saudi Arabia] are generally improving after Qatar toned down criticism of the House of Saud on Al Jazeera." Another WikiLeaks document indicated that Al Jazeera "has proved itself a useful tool for the station's political masters.". Journalist Don Debar, who has Al Jazeera experience, confirmed that the station has been heavily guided by the Qatari government in its policies. Stating, "The head of the bureau in Beirut quit, many other people quit because of the biased coverage and outright hand of the government in dictating editorial policy over Libya, and now Syria". Beginning in med-February 2011, Bahrain's main television station, BTV, launched a series of talk shows whose sole purpose appears to have been the incitement of public opinion against opposition sympathizers. Protesters were described by talk-show hosts as 'terrorists', 'foreign agents' and 'thugs'. Another instance was the supposed death of a Saudi Arabian soldier on 15 March 2011, reported by the Associated Press. The information was said to have come from a Saudi official, but Bahrain news organizations denied the report and the Commission of Inquiry, again, found no proof of it. King Hamad took a series of steps aimed at initiating a period of reconciliation following the unrest in February and March 2011. He established the Bahrain national dialogue on 1 July 2011 as a forum for the discussion and promotion of reform. The National Dialogue aims to establish "common principles for the relaunch of the political reform process," according to chairman Khalifa Al Dhahrani. The genuine substance of this proposal has been disputed by many opposition figures. – it has even been referred to disparagingly as a "chitchat room". Out of 300 participants, Al Wefaq, Bahrain's main opposition party had only 5 seats and pulled from the dialogue 2 weeks after it started and about 1-week before it ended. In total the opposition parties had only 25 out of 300 seats, Maryam al-Khawaja said. In 2011, the government of the United Kingdom approved the sale of military equipment valued at more than £1m to Bahrain, following the violent crackdown on demonstrators. This included licenses for gun silencers, weapons sights, rifles, artillery and components for military training aircraft; at least some of the equipment used by Al Khalifa regime to suppress demonstrations was imported from Britain. The UK subsequently revoked many of its export licenses to Bahrain, amidst public pressure. The 2012 status of these licenses has not been substantially documented. The United Kingdom has close ties with the Bahraini regime; indeed, in late 2012, the United Kingdom signed a defense cooperation agreement with the Bahraini government. In June 2013, delegates from Bahrain, where allegations of torture in police custody and in prisons are widespread, were given permission to access the Yarl's Wood Immigration Removal Centre in Bedfordshire accompanied by members of the UK prison watchdog HMIP. In September 2016, a report revealed a state-owned Belfast business has trained forces in Bahrain that use torture to secure death sentences. Northern Ireland Co-operation Overseas Ltd, or NI-CO nico.org.uk, has worked with Bahrain's police, prison guards and ombudsman's office for years. The company trains Bahrain's Interior Ministry Ombudsman, a watchdog which knowingly refused for more than two years to investigate complaints regarding the torture of Mohamed Ramadan—a father-of-three on death row who was tortured into making a false confession. NI-CO is embedded in Bahrain's internal security apparatus: a victim could be abused by NI-CO trained police, tortured in prison by NI-CO trained guards, and then have their torture allegation investigated and dismissed by the NI-CO trained ombudsman. In 2015–16, the UK Foreign Office awarded NI-CO over £900,000 out of a £2 million aid package to promote purported human rights reform in Bahrain, which is a close British ally. Reprieve a human rights defender organisation published an investigative report about Britain involvement in Bahrain's regime autrocity in 2016. The report says that seven innocent men are facing the death penalty in Bahrain after being tortured into the false confessions of crimes. On 13 January 2017, it emerged that a controversial multimillion-pound programme of support for Bahrain's security and justice system was being bolstered by a further £2m of British funding, despite the Persian Gulf state reversing reforms to an intelligence agency accused of torture. Only two days later, on Sunday 15 January 2017 Al Khalifa regime executed 3 Bahraini activists amid public anger. ^ a b Staff (4 February 2011). "Calls for Weekend Protests in Syria – Social Media Used in Bid To Mobilise Syrians for Rallies Demanding Freedom, Human Rights and the End to Emergency Law". Al Jazeera. Archived from the original on 8 February 2011. Retrieved 31 March 2011. ^ Imtiaz, Saba (17 March 2011). "Pakistani Workers Seek Cover Amid Bahrain Turmoil". The Express Tribune. Retrieved 15 April 2011. ^ a b Staff writer (18 February 2011). "Bahrain Mourners Call for End to Monarchy – Mood of Defiance Against Entire Ruling System After Brutal Attack on Pearl Square Protest Camp That Left at Least Five Dead". London: Associated Press (via The Guardian). Archived from the original on 18 February 2011. Retrieved 31 March 2011. ^ Ahmad, Imtiaz (25 March 2011). "Pak Worries Being Mercenary Hub". Hindustan Times. Retrieved 15 April 2011. ^ Abdo, Genieve; Ali, Jasim Husain – essay (3 April 2011). "Misunderstanding Bahrain's Shia Protesters – Predominately Shia Protesters Are Calling for Political Reform Not Alignment with Iran, Researchers Argue". Al Jazeera English. Retrieved 15 April 2011. ^ Staff writer (14 January 2012). وفاة بحرينية بعد إحراق نفسها في السنابس (in Arabic). Al-Wasat (Bahraini newspaper). Retrieved 14 January 2012. ^ a b c Staff writer (11 February 2011). "Bahrain's King Gifts $3,000 to Every Family". Agence France-Presse (via France 24). Archived from the original on 11 February 2011. Retrieved 31 March 2011. ^ a b c d Staff writer (12 February 2011). "Bahrain Doles Out Money to Families". Al Jazeera English. Retrieved 31 March 2011. ^ أحزاب المعارضة الأردنية تدين مشاركة قوات أردنية في قمع الاحتجاجات البحرينية. United Press International (via Manama Voice). 6 September 2011. Retrieved 23 July 2012. ^ الأردن تنفي وجود قوات لها في البحرين لقمع الأحتجاجات الشعبية. Manama Voice. 7 September 2011. Retrieved 23 July 2012. ^ "Pakistani troops aid Bahrain's crackdown". Al Jazeera English. 30 July 2011. Retrieved 12 February 2016. ^ "Pakistan not sending troops to Bahrain or Saudi: PM". Dawn. 24 March 2014. Retrieved 12 February 2016. In 2011, Pakistan had helped Bahrain quell an uprising against the monarchy by sending security personnel recruited through military’s welfare wings – Fauji Foundation and Bahria Foundation. ^ a b c d e f g h i j k l m n o p q r s t u v w x y z aa ab ac ad ae af ag ah ai aj ak al am an ao ap aq Report of the Bahrain Independent Commission of Inquiry (PDF) (Report). Bahrain Independent Commission of Inquiry. 23 November 2011. ^ Staff writer (18 July 2011). "POMED Notes: Maryam al-Khawaja – An Update on Bahrain". Project on Middle East Democracy. Retrieved 6 January 2011. ^ "Bahrain". The 2011 US Department of State Background Notes. United States Department of State. Retrieved 2 March 2012. The Bahrain Defense Force (BDF) numbers about 13,000 personnel. ^ "Bahrain". The 2011 US Department of State Background Notes. United States Department of State. Retrieved 2 March 2012. Bahrain also has a national guard that consists of about 2,000 personnel. ^ 4 on 14 February (BICI page 68), 25 on 15 February , 600+ on 17 February , 774 on 11 March , 905+ on 13 March   , 250 on 15 March , 150+ on 16 March  and extra 200 . ^ "Bahrain inquiry confirms rights abuses". Al Jazeera. 23 November 2011. Retrieved 24 January 2012. ^ a b Report of Bahrain NGOs (PDF) (Report). Bahrain Centre for Human Rights. 22 November 2011. ^ "Bahrain: Alarming spike in expulsion of citizens arbitrarily stripped of their nationality". Amnesty.org. ^ مجلس الوزراء: تقرير اللجنة المستقلة لتقصي الحقائق يعكس التزام عاهل البلاد بالوقوف على حقيقة وقائع الاحداث التي شهدتها البلاد. Bahrain News Agency. 21 November 2011. Retrieved 14 June 2012. ^ "Bahrain police injured in bomb attack". BBC News. 10 April 2012. Retrieved 14 June 2012. ^ "Bahrain king declares martial law over protests". NBC News. 15 March 2011. Retrieved 5 August 2015. ^ "Emirati hero killed in the line of duty in Bahrain laid to rest". The National. Retrieved 28 July 2015. ^ a b "Bahrain arrests 183 protesters, including 31 children in one month – opposition". RT. 17 January 2014. Retrieved 17 January 2014. ^ "GCC Members Consider Future of Union". ^ Richard Davies, Thomas (26 June 2014). "The failure of strategic nonviolent action in Bahrain, Egypt, Libya and Syria: 'political ju-jitsu' in reverse" (PDF). Global Change, Peace and Security. 26 (3): 299–313. doi:10.1080/14781158.2014.924916. ^ "Molotov Cocktails Rain Down on Police". Military.com. 16 March 2012. ^ Erlich, Reese (12 December 2012). "Bahrain's Changing Opposition". Global Post Public Radio International. Retrieved 10 February 2018. ^ "Wikileak Cables: Bahrain's Shia Political Leaders Visit Iraq". The Daily Telegraph. 18 February 2011. ^ a b c "Bahrain Activists in 'Day of Rage'". Al Jazeera. 14 February 2011. Archived from the original on 10 April 2011. Retrieved 14 April 2011. ^ a b c d "Clashes Rock Bahraini Capital". Al Jazeera. 17 February 2011. Archived from the original on 17 February 2011. Retrieved 15 April 2011. ^ a b "Bahrain Protests: Police Break Up Pearl Square Crowd". BBC News. 17 February 2011. Archived from the original on 5 April 2011. Retrieved 15 April 2011. ^ Khalifa, Reem (14 February 2015). "Bahrain Protesters Rally On Anniversary Of Crushed Uprising". The Huffington Post. Retrieved 2 April 2015. ^ "Bahrain King Declares State of Emergency after Protests". BBC News. 15 March 2011. Archived from the original on 5 April 2011. Retrieved 15 April 2011. ^ Cloud, David S.; Banerjee, Neela (16 March 2011). "Bahrain Protests: In Bahrain, Forces Move Against Protesters in Capital". Los Angeles Times. Archived from the original on 23 May 2011. Retrieved 15 April 2011. ^ Hammond, Andrew (4 June 2012). "Bahrain says group follows violent Shi'ite cleric". The Daily Star. Reuters. Retrieved 6 September 2012. ^ "Bahrain forces quash protests". The Independent. Reuters. 25 March 2011. Retrieved 6 September 2012. ^ a b c "Bahrain's Shias demand reform at mass rally". Al Jazeera English. 10 March 2012. Retrieved 10 March 2012. ^ "Tens of thousands join protest in Bahrain". Al Jazeera English. 31 August 2012. Retrieved 6 September 2012. ^ "Bahrain live blog 25 Jan 2012". Al Jazeera English. 25 January 2012. Archived from the original on 5 December 2012. Retrieved 17 February 2012. ^ "Heavy police presence blocks Bahrain protests". Al Jazeera English. 15 February 2012. Retrieved 17 February 2012. ^ Law, Bill (6 April 2011). "Police Brutality Turns Bahrain Into 'Island of Fear'". Crossing Continents. BBC News. Retrieved 15 April 2011. ^ Alisa, Zayd (30 March 2011). "USA Emphatic Support to Saudi Arabia". Scoop. Retrieved 15 April 2011. ^ Cockburn, Patrick (18 March 2011). "The Footage That Reveals the Brutal Truth About Bahrain's Crackdown". The Independent. Retrieved 15 April 2011. ^ Wahab, Siraj (18 March 2011). "Bahrain Arrests Key Opposition Leaders". Arab News. Archived from the original on 7 March 2012. Retrieved 15 April 2011. ^ Law, Bill (22 March 2011). "Bahrain Rulers Unleash 'Campaign of Intimidation'". Crossing Continents. BBC News. Retrieved 15 April 2011. ^ Chick, Kristen (1 April 2011). "Bahrain's Calculated Campaign of Intimidation". The Christian Science Monitor. Retrieved 15 April 2011. ^ "Bahrain inquiry confirms rights abuses". Al Jazeera English. 23 November 2011. Archived from the original on 3 October 2012. ^ "Applying pressure on Bahrain". The Washington Post. 9 May 2011. Archived from the original on 3 October 2012. Retrieved 9 May 2011. ^ "HM King Hamad Sets up Royal Independent Investigation Commission". Bahrain News Agency. 29 June 2011. Retrieved 1 September 2012. ^ a b "Bahrain protesters join anti-government march in Manama". BBC. 9 March 2012. Archived from the original on 3 October 2012. Retrieved 11 March 2012. ^ a b Kristian Coates (23 November 2011). "Bahrain's uncertain future". Foreign Policy. Retrieved 11 March 2012. ^ a b "Bahrain warns against Egypt-inspired protests". Fox News. Agence France-Presse (AFP). 14 July 2013. Retrieved 10 August 2013. ^ "Voices from Bahrain: Anniversary of the Uprising". Freedom House. 15 February 2012. Retrieved 30 May 2012. ^ a b c Jane Kinninmont (28 February 2011). "Bahrain's Re-Reform Movement". Foreign Affairs. Retrieved 21 July 2012. ^ Khalaf, Abdulhadi. Contentious Politics in Bahrain, From Ethnic to National and Vice Versa. The Fourth Nordic Conference on Middle Eastern Studies: The Middle East in a Globalizing World, Oslo, 13–16 August 1998. Retrieved 22 July 2012. ^ a b "Routine Abuse, Routine Denial: Civil Rights and the Political Crisis in Bahrain". Human Rights Watch. UNHCR. 1 January 2006. Retrieved 19 July 2012. ^ "Bahrain – News Archive". Election Guide. 24 September 2011. Retrieved 2 July 2012. ^ a b Summary, "Torture Redux: The Revival of Physical Coercion during Interrogations in Bahrain". Human Rights Watch. 8 February 2010. ISBN 978-1-56432-597-6. Retrieved 19 June 2011. ^ Michele Dunne (18 February 2011). "The Deep Roots of Bahrain's Unrest". Carnegie Endowment for International Peace. Retrieved 22 July 2012. ^ "Bahrain Sa'id 'Abd al-Rasul al-Iskafi". Amnesty International. 27 September 1995. Retrieved 2 February 2012. ^ "Routine abuse, routine denial". Human Rights Watch. 1 June 1997. Retrieved 2 February 2012. ^ US Department of State, Bahrain Country Report on Human Rights Practices for 2001, and Working group on arbitrary detention, para 90. ^ a b c d e f g "Bahrain opposition calls for rally". Al Jazeera. 13 February 2011. Retrieved 24 June 2012. ^ a b c d e "Issues Behind Protests in Bahrain". 660 News. Associated Press. 18 February 2011. Archived from the original on 27 November 2012. Retrieved 21 January 2012. ^ "What's behind Bahrain protests?". International Freedom of Expression Exchange. 18 February 2011. Retrieved 21 July 2012. ^ "Bahrain's economy praised for diversity and sustainability". Bahrain Economic Development Board. Archived from the original on 28 December 2010. Retrieved 24 June 2012. ^ Elizabeth Broomhall (7 July 2011). "Bahrain and Oman have highest Gulf unemployment rates". Arabian Business. Retrieved 9 July 2012. ^ Shrivastava, Sanskar (15 March 2011). "Saudi Arabian Troops Enter Bahrain, Bahrain Opposition Calls It War". The World Reporter. Retrieved 15 April 2011. ^ Shihab-Eldin, Ahmed (10 November 2011). "Human Rights in Bahrain, a Casualty of Obama's Double-Standard". Huffington Post. Retrieved 15 April 2012. ^ Adrian Blomfield (6 September 2011). "Bahrain hints at Iranian involvement in plot to overthrow government". The Telegraph. Retrieved 1 September 2012. ^ Kenneth Katzman (21 March 2011). "Bahrain: Reform, Security, and U.S. Policy". Congressional Research Service. Retrieved 2 July 2012. ^ "Bahrain activists in 'Day of Rage'". Al Jazeera. 14 February 2011. Retrieved 25 June 2012. ^ "Calls for weekend protests in Syria". Al Jazeera. 4 February 2012. Retrieved 24 June 2012. ^ Stephen Zunes (2 March 2011). "America Blows It on Bahrain". Foreign Policy in Focus. Retrieved 25 June 2012. ^ "Bahrain doles out money to families". Al Jazeera. 12 February 2011. Retrieved 25 June 2012. ^ Malas, Nour; Hafidh, Hassan; Millman, Joel (5 February 2011). "Protests Emerge in Jordan, Bahrain". The Wall Street Journal. Archived from the original on 7 February 2011. Retrieved 6 February 2011. ^ "An Open Letter to the King of Bahrain To Avoid the Worst Case Scenario" (Press release). Bahrain Centre for Human Rights. 12 February 2011. Archived from the original on 13 February 2011. Retrieved 31 March 2011. ^ Carey, Glen (13 February 2011). "Bahrain Human-Rights Organization Urges King to Free Detainees". Bloomberg. Archived from the original on 13 February 2011. Retrieved 31 March 2011. ^ قتيل وأكثر من 30 مصاباً في مسيرات احتجاجية أمس. Al Wasat. 15 February 2011. Retrieved 25 June 2012. ^ Randeree, Bilal (15 February 2011). "Deaths Heighten Bahrain Tension". Al Jazeera. Archived from the original on 5 April 2011. Retrieved 14 April 2011. ^ a b "Bahrain Investigates Protest Death". Al Jazeera. 15 February 2011. Archived from the original on 16 February 2011. Retrieved 15 April 2011. ^ Slackman, Michael (15 February 2011). "Bahrain Takes the Stage with a Raucous Protest". The New York Times. ^ Murphy, Brian (15 February 2011). "Bahrain Square Becomes New Center for Arab Anger". Associated Press (via ABC News). Retrieved 15 April 2011. ^ "BAHRAIN: Sunni detainee still held under mysterious circumstances". Los Angeles Times. 4 June 2011. Retrieved 26 July 2011. ^ "Bahrain: Explain Protester's Detention". Human Rights Watch. 10 March 2011. Retrieved 26 July 2011. ^ Hani al-Fardan (24 July 2011). الإفراج عن المعتقل الاول في أحداث البحرين محمد البوفلاسة (in Arabic). Manama Voice. Retrieved 26 July 2011. ^ Razaq, Rashid (17 February 2011). "Girl, 2, Shot Dead as Bahrain Police Swoop on Peaceful Protest Camp". Evening Standard. London. Retrieved 15 April 2011. ^ Box-Turnbull, Greg (18 February 2011). "5 Killed as Bahrain Cops Fire on Protesters". Daily Mirror. UK. Retrieved 15 April 2011. ^ Staff writer (17 February 2011). "Bahrain Military Locks Down Capital". Ynetnews. Retrieved 19 April 2011. ^ Martin Chulov (18 February 2011). "Bahrain protest: 'The regime must fall, and we will make sure it does'". The Guardian. Retrieved 25 July 2012. ^ "Bahrain: Army, Police Fire on Protesters". Human Rights Watch. 18 February 2011. Archived from the original on 28 July 2012. Retrieved 25 July 2012. ^ "Protesters Back in Bahrain Centre". Al Jazeera. 20 February 2011. Archived from the original on 5 April 2011. Retrieved 15 April 2011. ^ "Day of Transformation in Bahrain's 'Sacred Square'". BBC News. 19 February 2011. Archived from the original on 5 April 2011. Retrieved 15 April 2011. ^ "Thousands Stage Anti-Government Protest in Bahrain". Reuters. 25 February 2011. Retrieved 15 April 2011. ^ Michael Slackman and Nadim Audi (25 February 2011). "Protesters in Bahrain Demand More Changes". The New York Times. Retrieved 29 August 2012. ^ Stephen Zunes (2 March 2011). "America Blows It on Bahrain". Foreign Policy in Focus. Retrieved 12 September 2012. ^ "Protests at Bahrain's parliament". Al Jazeera. 28 February 2011. Retrieved 30 August 2012. ^ "Comparing the Areas of the Protest in ... Pearl Square, Bahrain; Tahrir Square, Egypt". The New York Times. 23 February 2011. Retrieved 15 April 2011. ^ "الداخلية": إطلاق سراح 308 أشخاص تنفيذاً للعفو الملكي | الوسط اون لاين – صحيفة الوسط البحرينية – مملكة البحرين. Alwasat (in Arabic). Retrieved 15 April 2011. ^ Richter, Frederick (26 February 2011). "Shi'ite Dissident Returns to Bahrain from Exile". Reuters. Retrieved 15 April 2011. ^ Dunlop, W.G. (27 February 2011). "Thousands Protest in Bahrain as MPs Resign". Archived from the original on 22 February 2013. Retrieved 15 April 2011. ^ March 2011&storyid=300970. Gulf Daily News. ^ "Anti-government protests in Bahrain". Al Jazeera. 4 March 2011. Retrieved 30 August 2012. ^ "New Sectarian Violence Erupts in Bahrain Protests". Voice of America News. 4 March 2011. Retrieved 4 March 2011. ^ "Bahrain youth march on state TV". Al Jazeera. 4 March 2011. Retrieved 30 August 2012. ^ "Thousands Protest in Bahrain". Al Jazeera. 6 March 2011. Archived from the original on 12 April 2011. Retrieved 15 April 2011. ^ Gregg Carlstrom (7 March 2011). "Protesters dig in at Bahraini financial hub". Al Jazeera. Retrieved 30 August 2012. ^ Noueihed, Lin (8 March 2011). "Hardline Shiite Groups Demand Republic in Bahrain". Reuters (via The Gazette). Archived from the original on 11 October 2012. Retrieved 15 April 2011. 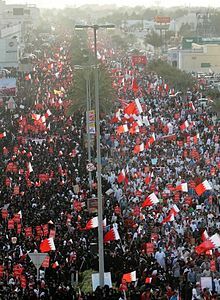 ^ "Thousands stage rally in Bahrain". Al Jazeera. 9 March 2011. Retrieved 30 August 2012. ^ Frederik Richter and Lin Noueihed (11 March 2011). "Bahrain police block march on royal palace". Reuters. Retrieved 30 August 2012. ^ a b "Footage Shows Crackdown in Bahrain". Al Jazeera. 13 March 2011. Archived from the original on 15 April 2011. Retrieved 15 April 2011. ^ a b "Footage shows crackdown in Bahrain". Al Jazeera. 13 March 2011. Retrieved 30 August 2012. ^ "Bahrain unrest: Manama erupts in violence". BBC News. 13 March 2011. Retrieved 30 August 2012. ^ "Witnesses: King's supporters confront Bahrain students". CNN. 13 March 2011. Retrieved 30 August 2012. ^ Bronner, Ethan; Slackman, Michael (14 March 2011). "Saudi Troops Enter Bahrain to Help Put Down Unrest". The New York Times. Archived from the original on 17 March 2011. Retrieved 14 March 2011. ^ Bill Law (14 December 2011). "Saudi crackdown takes on sectarian character". BBC News. Retrieved 23 January 2012. ^ a b c d e f "Two Killed in Bahrain Violence Despite Martial Law". BBC News. 15 March 2011. Archived from the original on 5 April 2011. Retrieved 15 April 2011. ^ Michael Birnbaum and Joby Warrick (17 March 2011). "Bahrain arrests opposition leaders as crackdown intensifies". The Washington Post. Retrieved 30 August 2012. ^ a b "Curfew Follows Deadly Bahrain Crackdown". Al Jazeera. 16 March 2011. Archived from the original on 14 April 2011. Retrieved 16 April 2011. ^ a b c d e f g h i j May Ying Welsh and Tuki Laumea (2011). Bahrain: Shouting in the Dark. Bahrain: Al Jazeera. Retrieved 29 July 2012. ^ a b "Bahrain: Protest Leaders Arbitrarily Detained". Human Rights Watch. 18 March 2011. Retrieved 25 August 2012. ^ a b "Arrests Follow Deadly Bahrain Crackdown". Al Jazeera. 17 March 2011. Archived from the original on 5 April 2011. Retrieved 16 April 2011. ^ a b "Live Blog: Bahrain Crackdown". Al Jazeera. 17 March 2011. Archived from the original on 19 March 2011. Retrieved 16 April 2011. ^ Ethan Bronner (17 March 2011). "Opposition Leaders Arrested in Bahrain as Crackdown Grows". The New York Times. Retrieved 30 August 2012. ^ Habib Toumi (17 March 2011). "Some top officials have quit, reports say". Gulf News. Retrieved 30 August 2012. ^ Sharmila Devi (8 October 2011). "Medical community urged to defend Bahraini doctors". The Lancet. 378 (9799): 1287. doi:10.1016/S0140-6736(11)61562-6. Retrieved 24 May 2012. ^ "Richard Sollom: The shocking thing is that Bahrain abuse is systematic". The Independent. London. 21 April 2011. ^ "Bahrain hospitals 'paralysed' by unrest". Al Jazeera. 7 April 2011. Retrieved 3 September 2012. ^ a b "U.S. Condemns Arrest of Opposition Figures in Bahrain". CNN. 19 March 2011. Retrieved 16 April 2011. ^ "Bahrain tears down protest symbol". Al Jazeera. 18 March 2011. Retrieved 1 September 2012. ^ Al A'Ali, Mohammed (11 March 2012). "FACELIFT". Gulf Daily News. Retrieved 11 March 2012. ^ "Bahrain must release woman activist convicted for listening to 'revolutionary' music". Amnesty International. 30 January 2012. Retrieved 30 January 2012. ^ a b Simeon Kerr and Robin Wigglesworth (22 March 2011). "Bahrain union suspends general strike". Financial Times. Retrieved 1 September 2012. ^ a b Noueihed, Lin; Richter, Frederick (25 March 2011). "Bahrain Forces Quash Small Protests in 'Day of Rage'". Reuters. Retrieved 22 April 2011. ^ Neela Banerjee (25 March 2011). "Protesters in Bahrain defy ban on rallies". Los Angeles Times. Retrieved 1 September 2012. ^ Staff writer (25 March 2011). "Bahraini Activists Plan Friday 'Day of Rage'". Al Jazeera. Retrieved 22 April 2011. ^ Simeon Kerr and Robin Wigglesworth (20 March 2011). "Bahrain crackdown spreads to villages". Financial Times. Retrieved 1 September 2012. ^ "Pakistani workers in Bahrain live in fear". Al Jazeera. 25 March 2011. Retrieved 1 September 2012. ^ "Bahrain shuns Kuwait's mediation offer". Al Jazeera. 28 March 2011. Retrieved 1 September 2012. ^ "Bahrain Shia leader says Saudi force must go". Al Jazeera. 30 March 2011. Retrieved 1 September 2012. ^ "Bahrain steps up crackdown on opposition". Al Jazeera. 31 March 2011. Retrieved 1 September 2012. ^ Bill Law (6 April 2011). "Police brutality turns Bahrain into 'island of fear'". BBC. Retrieved 1 September 2012. ^ "Bahrain cracks down on protesting footballers". Al Jazeera. 15 April 2011. Retrieved 3 September 2012. ^ Hugh Tomlinson (8 April 2011). "Sportsmen feel heat from Bahrain regime". The Times (The Australian). Retrieved 3 September 2012. ^ Elliott Abrams (22 April 2011). "Bahrain Heads for Disaster". Council on Foreign Relations. Retrieved 3 September 2012. ^ "Bahrain bans main opposition newspaper". Al Jazeera. 3 April 2011. Retrieved 1 September 2012. ^ "Bahrain opposition 'eases demands'". Al Jazeera. 3 April 2011. Retrieved 2 September 2012. ^ "Bahrain: Free Prominent Opposition Activist". Human Rights Watch. 9 April 2011. Retrieved 31 August 2012. ^ Frank Gardner (9 April 2011). "Leading Bahrain activist Abdulhadi al-Khawaja arrested". BBC. Retrieved 3 September 2012. ^ a b "Bahraini woman on hunger strike over arrests". Al Jazeera. 12 April 2011. Retrieved 3 September 2012. ^ "Bahraini activist 'assaulted and arrested'". Al Jazeera. 9 April 2011. Retrieved 3 September 2012. ^ "Bahrain: Attack on Rights Defender's Home". Human Rights Watch. 18 April 2011. Retrieved 18 May 2011. ^ "Bahrain's security clampdown divides kingdom". BBC. 14 April 2011. Retrieved 3 September 2012. ^ "Bahrain government moves to disband Shia opposition". BBC. 14 April 2011. Retrieved 3 September 2012. ^ "Bahrain backs off plan to ban opposition after US criticism". The Christian Science Monitor. 15 April 2011. Retrieved 31 August 2012. ^ "Bahrain 'arrests rights lawyer and doctors'". Al Jazeera. 16 April 2011. Retrieved 3 September 2012. ^ Alexandra Sandels (17 April 2011). "BAHRAIN: Security forces continue wide, deep crackdown on dissent". Los Angeles Times. Retrieved 12 September 2012. ^ "Bahrain sentences protesters to death". Al Jazeera. 28 April 2011. Retrieved 3 September 2012. ^ "Bahrain court upholds death sentences". Al Jazeera. 22 May 2012. Retrieved 10 September 2012. ^ "Bahrain workers fired for supporting protests". Al Jazeera. 6 April 2011. Retrieved 3 September 2012. ^ "Bahrain arrests opposition politicians". Al Jazeera. 2 May 2011. Retrieved 3 September 2012. ^ Margaret Warner (12 May 2011). "As Crackdown Nears End, Bahrainis Struggle to Turn the Page". PBS Newshour. Retrieved 6 September 2012. ^ "Bahrain's king orders end to emergency rule". Al Jazeera. 8 May 2011. Retrieved 6 September 2012. ^ Margaret Warner (13 May 2011). "Security Presence in Bahrain Squashes Embers of Uprising". PBS Newshour. Retrieved 6 September 2012. ^ Margaret Warner (17 May 2011). "Uncertainty Reigns in Bahrain Amid Mix of Normalcy, State of Siege". PBS Newshour. Retrieved 6 September 2012. ^ May Welsh (6 May 2011). "Crackdown reins in Bahrain activists". Al Jazeera. Retrieved 6 September 2012. ^ Teymoor Nabili (9 May 2011). "What's "normal" for Bahrain?". Al Jazeera. Retrieved 6 September 2012. ^ "Urgent action: Verdict expected for 13 opposition activists". Amnesty International. 7 August 2012. Retrieved 24 August 2012. ^ "Bahrain: Activist Bears Signs of Abuse". Human Rights Watch. 10 May 2011. Retrieved 25 August 2012. ^ "Bahrain police detain 2 reporters for foreign media". Reuters. 23 May 2011. Retrieved 6 September 2012. ^ "Nine policemen run over by rioter". Gulf Daily News. 18 May 2011. Retrieved 31 August 2012. ^ al-Durazi, Hussain (28 May 2011). قوّات أردنيّة ويمنيّة في البحرين. Al Akhbar. Retrieved 31 August 2012. ^ "Al-Wefaq to shun parts of Bahrain 'dialogue'". Al Jazeera. 8 July 2011. Retrieved 10 July 2011. ^ "Protestors doubt Bahrain dialogue will end crisis". Reuters. 1 July 2011. Retrieved 10 July 2011. ^ "Bahrain Dialogue Receives Mixed Reaction". VOA News. 6 July 2011. Retrieved 10 July 2011. ^ "Bahrain's Human Rights Crisis". Human Rights Watch. 5 July 2011. ^ "Bahrain police 'suppress protest'". Al Jazeera. 3 June 2011. Retrieved 4 June 2011. ^ BAHRAIN: Formula 1 boss says Grand Prix canceled -Los Angeles Times. ^ "Bahrain medics on trial over protests". Al Jazeera. Archived from the original on 13 June 2011. Retrieved 14 June 2011. ^ "Bahrain to lift ban on opposition party". The Lincoln Tribune. 18 June 2011. Retrieved 24 June 2011. ^ Bill Law (17 June 2011). "Bahrain unrest: Eight Shia activists sentenced to life". BBC. Archived from the original on 23 June 2011. Retrieved 23 June 2011. ^ Chulov, Martin (22 June 2011). "Bahrain rights activists jailed for life | World news". The Guardian. UK. Archived from the original on 22 June 2011. Retrieved 22 June 2011. ^ "Life sentences for Bahrain activists". Al Jazeera. Archived from the original on 22 June 2011. Retrieved 22 June 2011. ^ Rebecca Torr (1 February 2012). "Second dialogue chance for unity". Gulf Daily news. Retrieved 2 February 2012. ^ a b "Ray of hope amid statements about national solution". Gulf News. 31 January 2012. Retrieved 2 February 2012. ^ "Worried Bahrainis seek talks as clashes worsen". Arabain Business. Reuters. 2 February 2012. Retrieved 2 February 2012. ^ الإعلان عن حوار لمّ الشمل خلال أيام (in Arabic). Al Ayam. 7 March 2012. ^ "Renewed protests demand democracy in Bahrain". CNN. 9 March 2012. Retrieved 10 March 2012. ^ "Hundreds of thousands protest for democracy in Bahrain". Al Akhbar. 9 March 2012. Retrieved 11 March 2012. ^ Simeon Kerr (9 March 2012). "Bahrain protesters march in huge rally". Financial Times. Retrieved 10 March 2012. ^ "Bahrain police injured in bomb attack". BBC. 10 April 2012. Retrieved 9 June 2012. ^ Priestley, Marc (18 April 2012). "@f1elvis – 18 April". @f1elvis. Twitter. Retrieved 18 April 2012. ^ Cooper, Adam (19 April 2012). "@adamcooperf1 – 19 April". @adamcooperf1. Twitter. Retrieved 19 April 2012. ^ "Bahrain protesters swell ahead of F1 weekend". Fox News Channel. 20 April 2012. ^ Spurgeon, Brad (20 April 2012). "The Unforeseen Consequences of the Bahrain Grand Prix". The New York Times. ^ Tim Phillips, "White House Continues to Support Brutally Repressive Regime in Bahrain", Activist Defense, 20 November 2012. ^ Hamad I Mohammed (5 July 2013). "Is Bahrain Next?". As-Safir. Translated by Sahar Ghoussoub. Al Monitor. Retrieved 10 August 2013. ^ "Bahrain steps up security ahead of rebellion movement call". The Philippine Star. Xinhua News Agency. 14 July 2013. Retrieved 10 August 2013. ^ "Bahrain arrests 25 after death of 3 policemen in bomb attack". Bahrain News.Net. Retrieved 4 March 2014. ^ "Bahrain holds disputed election". BBC News. 22 November 2014. ^ "In Fear of Transmitting the Tunisian and Egyptian Demonstrations to Bahrain: Blocking a Facebook Group That Calls People To Go Down the Streets and Demonstrate Against the Authority's Policy" (Press release). Bahrain Centre for Human Rights. 6 February 2011. Archived from the original on 9 February 2011. Retrieved 16 April 2011. ^ a b Zavis, Alexandra; Daragahi, Borzou (6 February 2011). "Bahrain: Authorities Crack Down on Dissent on the Web, Rights Group Says". Babylon and Beyond (blog of Los Angeles Times). Archived from the original on 9 February 2011. Retrieved 16 April 2011. ^ "Bahrain Steps Up Crackdown on Opposition". Al Jazeera. 31 March 2011. Archived from the original on 5 April 2011. Retrieved 16 April 2011. ^ Solomon, Erika (1 April 2011). "Bahrain Steps Up Detentions, Releases Prominent Blogger". Reuters (via AlertNet). Archived from the original on 6 April 2012. Retrieved 16 April 2011. ^ Lubin, Gus (2 March 2011). "These Are the Controversial Satellite Photos That Set Off Protests in Bahrain". Business Insider. Archived from the original on 13 May 2011. Retrieved 16 April 2011. ^ "Bahrain Bans Main Opposition Newspaper". Al Jazeera. 3 April 2011. Archived from the original on 5 April 2011. Retrieved 16 April 2011. ^ (registration required) "Bahrain Closes Only Independent Paper". Financial Times. 3 April 2011. Archived from the original on 7 April 2011. Retrieved 3 April 2011. ^ "Bahrain Workers Fired for Supporting Protests". Al Jazeera. 6 April 2011. Archived from the original on 10 April 2011. Retrieved 16 April 2011. ^ "Bahrain Moves To Ban Main Opposition Party". Al Jazeera. 14 April 2011. Archived from the original on 15 April 2011. Retrieved 16 April 2011. ^ "Bahrain Backs Off on Opposition Party Ban". Al Jazeera. 15 April 2011. Archived from the original on 15 April 2011. Retrieved 16 April 2011. ^ a b "Schoolgirls 'beaten' in Bahrain raids". Al Jazeera. 11 May 2011. Archived from the original on 14 May 2011. Retrieved 14 May 2011. ^ a b "Bahrain targets Shia religious sites". Al Jazeera. 14 May 2011. Archived from the original on 14 May 2011. Retrieved 14 May 2011. ^ Fisk, Robert (14 May 2011). "Robert Fisk: Why no outcry over these torturing tyrants?". The Independent. London. Archived from the original on 14 May 2011. Retrieved 14 May 2011. ^ "Belfast to Bahrain: the torture trail" (PDF). Reprieve. ^ a b c "Mohammed Ramadan". ^ a b "Britain Funded Torture Training in Bahrain". Voice of Bahrain. ^ "Bahraini authorities execute three Shia Muslim men convicted of killing an Emirati police". The Telegraph. 15 January 2017. ^ "Bahrain Executes Stateless Torture Victims Following King Hamad's Authorization". Americans for Democracy & Human Rights in Bahrain. ^ السلطات الأمنية تطلب من 16 لبنانياً مغادرة البحرين. Alwasat (in Arabic). Retrieved 24 April 2011. ^ Elise Labott "Bahrain government accuses Hezbollah of aiding opposition groups". CNN. 25 April 2011. ^ Jay Solomon (25 April 2011). "Bahrain Sees Hezbollah Plot in Protest". The Wall Street Journal. ^ "US Diplomat Tom Malinowski Expelled from Bahrain". BBC News. 7 July 2014. Retrieved 10 February 2018. ^ Piven, Ben (10 July 2011). "The US and Bahrain. Sending Ludo home". Al Jazeera. Retrieved 10 February 2018. ^ Peter Walker (22 June 2011). "Bahraini activist's father jailed for life". The Guardian. UK. Archived from the original on 26 June 2011. Retrieved 24 June 2011. ^ Robert Mackey (22 June 2011). "Bahrain Sentences Activists to Life in Jail". The Guardian. UK. Archived from the original on 23 June 2011. Retrieved 24 June 2011. ^ Nic Robertson (12 June 2011). "Bahrain tries ex-lawmakers, imprisons poet". CNN. Retrieved 12 June 2011. ^ "Bahrain: Arrest and detention of human rights lawyer Mr Mohammed Al-Tajir". Front Line. 18 April 2011. Archived from the original on 9 February 2012. Retrieved 23 January 2012. ^ "City Bar Calls on Bahraini Government to Respect Fundamental Rights and the Role of Lawyers; Cites Case of Detained Defense Lawyer Mohammed al-Tajer". 44th Street Blog. New York City Bar Association. 30 June 2011. Retrieved 23 January 2012. ^ "Lawyer released in Bahrain" (PDF). Amnesty International. 9 August 2011. Retrieved 23 January 2012. ^ Mahmood Rafique "Bahrain releases 515 detainees since 15 March". 24x7 News. 22 May 2011. ^ Human Price of Freedom and Justice (PDF) (Report). Bahrain Centre for Human Rights, Bahrain Youth Society for Human Rights and Bahrain Human Rights Society. 22 November 2011. ^ a b c d e "Pakistani Veterans Beef Up Bahrain Security Forces". Voice of America. 17 August 2011. Retrieved 20 July 2012. ^ "Torture Redux". Human Rights Watch. 8 February 2010. Retrieved 21 July 2012. ^ a b "Bahrain security forces accused of deliberately recruiting foreign nationals". The Guardian. 17 February 2011. Retrieved 20 July 2012. ^ ""Bahrain: Dangerous Statistics and Facts about the National Security Apparatus". Bahrain Centre for Human Rights. 5 March 2009. Retrieved 20 July 2012". Bahrainrights.org. 8 March 2009. ^ a b c d e f "Pakistani troops aid Bahrain's crackdown". Al Jazeera. 30 July 2011. Retrieved 20 July 2012. ^ "Pak worries being mercenary hub". Hindustan Times. 25 March 2011. Retrieved 20 July 2012. ^ a b Ishaan Tharoor (23 February 2011). "A History of Middle East Mercenaries". Time. Retrieved 20 July 2012. ^ Sheikh Rashed bin Abdulla Al-Khalifa (19 October 2011). البحرين : مقابلة وزير الداخلية مع العربية [Bahrain: an interview with the ministry of interior] (YouTube) (in Arabic). Al-Arabiya (via Bahrain News Agency). Event occurs at 12:00. Retrieved 20 July 2012. ^ Bahrain: Shouting in the dark (YouTube). Al Jazeera. 4 August 2011. Event occurs at 15:50. Retrieved 20 July 2012. ^ "Bahrain Urgently Recruits More Mercenaries Amidst Political Crisis". Bahrain Centre for Human Rights. 11 March 2011. Retrieved 20 July 2012. ^ "Pakistan to send more troops to Bahrain". The Nation. 22 August 2011. Retrieved 20 July 2012. ^ Dina Indrasafitri (22 June 2011). "Govt denies hiring out mercenaries to Bahrain". The Jakarta Post. Retrieved 20 July 2012. ^ "Bahrain commission report: Expats subjected to ‘physical, psychological torture’". The Express Tribune. 26 November 2011. Retrieved 20 July 2012. ^ "164 Protesters Killed in Bahrain since Start of Uprising: Opposition". Tasnim News Agency. Retrieved 29 May 2014. ^ a b "Bahrain: MSF Condemns Armed Raid On Office and Detention of Staff Member". Médecins Sans Frontières. 3 August 2011. Archived from the original on 8 October 2011. Retrieved 10 March 2012. ^ Bill Law (24 February 2012). "Bahrain's 'underground medics' secretly treat injured protesters". BBC. Retrieved 18 March 2012. ^ Bahrain minister says 24 people dead in uprisings. ArabianBusiness.com. 29 March 2011. Retrieved 9 April 2011. ^ a b "Track down my father's killers". Gulf Daily News. 13 June 2011. Archived from the original on 20 January 2012. Retrieved 8 January 2012. ^ a b "Martyrs' Families Visited". Daily Tribune. 24 April 2011. Archived from the original on 24 July 2012. Retrieved 8 January 2012. ^ a b "طعنه الإرهابيون بوحشية وبلا رأفة وسكاكينهم اخترقت جسده النحيل". Al Ayam. 28 March 2011. Archived from the original on 19 January 2012. Retrieved 8 December 2012. ^ a b "تشييع جنازة راشد المعمري بمقبرة الرفاع". Al-Wasat. 22 March 2011. Retrieved 8 January 2012. ^ a b "Bahrain king declares martial law over protests". Associated Press. 15 March 2011. Retrieved 8 January 2012. ^ Chulov, Martin (15 March 2011). "Three killed as Bahrain's king declares martial law". The Guardian. London. Retrieved 8 January 2012. ^ a b List of people killed in Bahrain since 14 February 2011 – Extrajudicial Killing -Bahrain Centre for Human Rights. ^ Cassel, Matthew (16 February 2012). "Suppressing the narrative in Bahrain". Al Jazeera. Retrieved 21 February 2012. ^ a b Al-Khal, Abdulla. "International Media in Bahrain: Balanced of Biased?". MBRSC Post. Retrieved 7 April 2012. ^ "Bahrain: More martyrs, international activists deported, revolution continues". Bahrain Freedom Movement. Retrieved 21 February 2012. ^ "Government withdraws permission for visit by freedom of expression NGOs". Reporters Without Borders. 4 May 2012. Retrieved 15 May 2012. ^ "BBC admits errors in Bahrain unrest coverage". Trade Arabia. 29 June 2012. Retrieved 1 July 2012. ^ "BBC admits errors in unrest coverage". Gulf News Daily. 29 June 2012. Retrieved 1 July 2012. ^ a b c d e Hammond, Andrew (14 April 2011). "Gulf media find their red line in uprisings:Bahrain". Reuters Africa. Retrieved 26 April 2013. ^ a b c "Al Jazeera exodus: Channel losing staff over 'bias'". RT. 12 March 2012. Retrieved 26 April 2013. ^ a b c Kianpars (30 May 2011). "Al-Jazeera in the Crosshairs: Balanced Reporting or Sectarian Bias?". Aslan Media. Archived from the original on 2 April 2015. Retrieved 7 April 2012. ^ Amnesty International, "Bahrain: Investigation into rights abuses welcomed". Amnesty International. 30 June 2011. ^ Fakhro, Elham (2016). "Revolution in Bahrain". Civil Resistance in the Arab Spring. Oxford University Press. p. 103. ISBN 9780198749028. ^ a b Attacks on the Press 2004: Bahrain (14 March 2005). "Attacks on the Press 2004: Bahrain – Committee to Protect Journalists". Cpj.org. Retrieved 7 May 2011. ^ "Bahrain News Agency | News Al-Wasat Board of Directors Sacks Al-Jamri And Appoints Abidli Al-Abidli". Bna.bh. Retrieved 7 May 2011. ^ "Al-Wasat founder dies in custody in Bahrain". CPJ. 15 April 2011. Retrieved 20 April 2011. ^ "Report of the Bahrain Independent Commission of Inquiry" (PDF). 23 November 2011. ^ Press Freedom Index 2011–2012 (PDF) (Report). Reporters Without Borders. 2012. ^ a b Cockburn, Patrick (18 March 2011). "The footage that reveals the brutal truth about Bahrain's crackdown". The Independent. London. Retrieved 21 February 2012. ^ "Blocking a Facebook Group that Calls People to go Down the Streets and Demonstrate against the Authority's Policy". Bahrain Centre for Human Rights. 6 February 2011. Archived from the original on 9 February 2011. Retrieved 21 February 2012. ^ Mohammed, Hamad (13 April 2012). "Formula 1 says Bahrain race to go ahead despite tension". Reuters. Retrieved 4 May 2012. ^ Turner, Maran (20 April 2012). "Bahrain's Formula 1 is an insult to country's democratic reformers". CNN. Retrieved 4 May 2012. ^ Editorial (14 April 2012). "Bahrain Grand Prix: Formula One demeans itself with this event". The Guardian. London. Retrieved 4 May 2012. ^ Mekhennet, Souad (20 April 2012). "Bahrain's Formula One Gala Not going as Planned". The New York Times. Retrieved 4 May 2012. ^ "Media freedom flouted during Grand Prix, government PR operation flops". Reporters Without Borders. 20 April 2012. Retrieved 15 May 2012. ^ "Bahrain Protesters Hold Ground". Al Jazeera. 16 February 2011. Archived from the original on 16 February 2011. Retrieved 15 April 2011. ^ "Bahrain King Says Forces Have Foiled Foreign Plot". Reuters. Retrieved 9 April 2011. ^ Bahrain king speaks of 'foiled foreign plot'. Al Jazeera. 21 March 2011. Retrieved 9 April 2011. ^ Carey, Glen; Alexander, Caroline (18 February 2011). "Bahrain's King Seeks Talks With Foes Amid Clashes in Region". Bloomberg. Archived from the original on 29 April 2011. Retrieved 21 April 2011. ^ "Bahrain: Sunni leaders begin talks with Shia groups". BBC News. 2 July 2011. ^ "Al-Wefaq to shun parts of Bahrain 'dialogue'", Al Jazeera English, 8 July 2011. Retrieved 10 July 2011. ^ "Protesters doubt Bahrain dialogue will end crisis", Reuters, 1 July 2011. Retrieved 10 July 2011. ^ "Bahrain Dialogue Receives Mixed Reaction", VOA News, 6 July 2011. Retrieved 10 July 2011. ^ Sara Sorcher (18 July 2011). "What's The State of Play in Bahrain's Protests?". National Journal. Retrieved 7 January 2012. ^ "Bahrain Independent Commission of Inquiry". BICI. 23 November 2011. ^ Sotloff, Steven (20 February 2011). "Bahrain Protesters Took Back Pearl Square. What Next?". Foundation for Defense of Democracies. Retrieved 22 April 2011. ^ Mohamed al-A'ali (1 May 2011). "Two civic councils face dissolution". Gulf Daily News. ^ "Bahrain gears up for by-election". Trade Arabia. 1 August 2011. ^ "Bahrain holds vote to fill seats vacated during unrest". Al-Ahram/Thomson Reuters. 24 September 2011. Archived from the original on 24 September 2011. Retrieved 24 September 2011. ^ a b Bronner, Ethan (24 September 2011). "Bahrain Vote Erupts in Violence". The New York Times. Archived from the original on 24 September 2011. Retrieved 24 September 2011. ^ a b c Richard Norton-Taylor (14 February 2012). "Bahrain receives military equipment from UK despite violent crackdown". The Guardian. London. ^ "Bahrain and UK Sign Defence Cooperation Agreement". Bna.bh. ^ "Bahrain & UK sign Defense Cooperation Agreement". Mofa.gov.bh. ^ a b "UK links to Bahrain's 'torture prisons'". The Guardian. ^ "Belfast to Bahrain: the torture trail" (PDF). Reprieve. Reprieve's investigation into the work of NI-CO. September 2016. ^ "Northern Ireland Assembly – Minutes of Proceedings" (PDF). 5 October 2016: 3. ^ "Bahraini regime executes 3 Shiite activists amid public anger". Abna24. ^ Staff writer (21 February 2011). "Bahrain Grand Prix Called Off After Protests". BBC News. Retrieved 19 April 2011. ^ Phillips, Leigh (23 March 2011). "Bahrain Protest Crackdown Defended by European Union Envoy". The Guardian. Retrieved 19 April 2011. ^ Askari, Hossein; essay (18 March 2011). "A Marriage Made in Hell". The National Interest. Retrieved 21 April 2011. ^ Tomlinson, Hugh (21 July 2011). "US may quit troubled Bahrain". The Australian. Archived from the original on 20 July 2011. Retrieved 21 July 2011. ^ "Hague Condemns Violence in Libya, Bahrain and Yemen". BBC News. 19 February 2011. Archived from the original on 5 April 2011. Retrieved 21 April 2011. ^ "Obama dials Bahrain, Kazakhstan". Politico. 30 April 2011. Retrieved 1 May 2011. ^ Staff writer (16 March 2011). "Iran Condemns Bahraini Assault". Reuters (via The Irish Times). Retrieved 19 April 2011. ^ "Iran FM Discusses Bahrain Crisis with UN, AL Chiefs". Iranian Students News Agency. 16 March 2011. Archived from the original on 18 March 2011. Retrieved 19 April 2011. ^ Staff writer (20 March 2011). "Iran Escalates Diplomatic Row with Bahrain". United Press International. Retrieved 19 April 2011. ^ "Bahrain Recalls Envoy to Iran". Gulf Daily News. 16 March 2011. Retrieved 19 April 2011. ^ "Shiites Rally Behind Bahrain Protesters". Agence France-Presse (via ABC News). 17 March 2011. Retrieved 20 April 2011. ^ Jaffe, Greg (22 April 2011). "Bahrain crackdown fueling tensions between Iran, Saudi Arabia". The Washington Post. Retrieved 21 July 2011. ^ Slavin, Barbara (20 July 2011). "Bitter Divides Persist Below Bahrain's Relatively Calm Surface". IPS News. Archived from the original on 20 September 2011. Retrieved 21 July 2011. ^ al-Ansary, Khalid (16 March 2011). "Iraq's Sadr Followers March Against Bahrain Crackdown". Reuters. Retrieved 15 April 2011. ^ Arango, Tim (2 April 2011). "Shiites in Iraq Support Bahrain's Protesters". The New York Times. ^ "Physicians for Human Rights". Physicians for Human Rights. ^ Press release (17 March 2011). "Evidence of Bahraini Security Forces' Brutality Revealed". Amnesty International. Retrieved 21 April 2011. ^ Fisk, Robert (14 June 2011). "Robert Fisk: I saw these brave doctors trying to save lives – these charges are a pack of lies". The Independent. London. Archived from the original on 8 July 2011. Retrieved 14 June 2011. ^ Foreign and Commonwealth Office "Bahrain – Alistair Burt welcomes independent commission Bahrain – Alistair Burt welcomes independent commission". Foreign and Commonwealth Office. 30 June 2011. ^ Andrew Malcolm (2 July 2011). "Jay Carney says vacationing Obama welcomes new democratic dialogue in Bahrain". Los Angeles Times. ^ "Bahrain: Investigation into rights abuses welcomed". Amnesty International. 30 June 2011. ^ "Freedom House delegation denied entry". IFEX. 24 January 2012. ^ Hugh Tomlinson (6 April 2012). "Bahrain pays a king's ransom to PR companies to improve image". The Times. Retrieved 6 April 2012. ^ Bockenfeld, Cole (9 December 2011). "Meet Bahrain's lobbyists". The Hill. ^ "The Bahrain Regime's Western Hasbara Agents". Chan'ad Bahraini. 2 October 2011. Retrieved 11 April 2012. ^ Elliott, Justin (9 August 2011). "D.C. firm inks lucrative public-relations contract with Bahrain". Salon. ^ Elliott, Justin (28 February 2012). "Bahraini 'Reformers' in Washington, Courtesy of American Spinmeisters". ProPublica. ^ Whitaker, Brian (11 September 2011). "Spinning Bahrain, the Qorvis way". Al-Bab.com. ^ "Mid-East unrest: Arab states seek London PR facelift". BBC News. 1 March 2011. ^ Newman, Melanie (5 December 2011). "How the Bureau investigated Bell Pottinger". Bureau of Investigative Journalism. ^ Blumenthal, Paul (22 March 2011). "Bahrain's PR Team". Sunlight Foundation. ^ a b Gilligan, Andrew (11 March 2012). "Graeme Lamb: British general's company paid to support Bahrain dictatorship". The Daily Telegraph. London. Retrieved 13 March 2012. ^ Elliott, Justin (2 April 2012). "Meet Bahrain's Best Friend in Congress". ProPublica. ^ a b Elliott, Justin (1 September 2011). "Joe Trippi doing P.R. for Bahrain". Salon. ^ Hardigree, Matt (9 April 2012). "How Bahrain Spends Millions To Spin The Press". Jalopnik. Retrieved 11 April 2012. ^ "Buffing Up Bahrain". Private Eye (1284). 18–31 March 2011. He was coyly introduced as a "member of the British House of Lords" who "also advises the UK Bahrain All-Party Parliamentary Group". In fact this peer doesn't actually sit in the Lords. But could he be related to the Paddy Clanwilliam who founded Gardant Communications, a consultancy and lobbying firm which works directly for the Bahraini embassy (see Eye 1283)? Why yes he could! ^ "Washing your dirty laundry in public PR style". Alexofarabia's Blog. 1 July 2011. Retrieved 11 April 2012. ^ Elliott, Justin (10 June 2011). "DC law firm defends Bahrain on human rights crackdown". Salon. ^ a b Jones, Marc Owen (13 February 2012). "Are Bahrain finally getting their money's worth from a PR company?". marcowenjones.wordpress.com. ^ Cassel, Matthew (16 February 2012). "Suppressing the narrative in Bahrain". Al Jazeera. When asked if the Bahrain government was a client of Dragon Associates, Jones said that the firm was under contract with the BIC since "a few months ago". ^ Cooper, Adam (10 April 2012). "Bahrain hits back with positive Lotus report". Adam Cooper's F1 Blog. Retrieved 11 April 2012. ^ "BGR Holding for Bahrain Economic Development Board". Lobbying Tracker. Sunlight Foundation. Retrieved 11 April 2012. Niethammer, Katja (2008). "Opposition Groups in Bahrain". In Lust-Okar, Ellen; Zerhouni, Saloua (eds.). Political Participation in the Middle East. Boulder: Lynne Rienner. ISBN 978-1-58826-626-2.